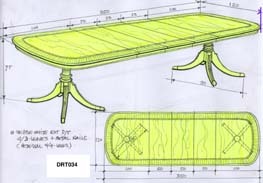 Customers come to AntiquePurveyor.com for tables - and dining tables are our passion. We focus on quality, competitive price points, wide variety and, most of all...inventory. We stock more finished tables than any other dealer we know about in the USA, and we carry everything from reproduction furniture to quality discount furniture. As you've probably concluded during this factory furniture tour, we take great pride in brining you a wide selection of classic and traditional high end furniture. Still, at AntiquePurveyor, it is our tables that we most enjoy presenting to you. We are especially proud of our fancy, formal and traditional mahogany dining tables and mahogany dining chairs but be assured that pride extends across our entire product line and includes our entire product line. 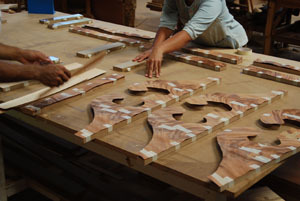 We hope you've enjoyed our entire Factory Tour, and that we have answered many of your fine furniture questions while helping you to feel a little more comfortable about ordering mahogany dining room tables and formal dining furniture over the Internet at Antiquepurver.com. Be sure to revisit our website and furniture blog frequently because new content is constantly being added. A drawing is always a good place to start. Below is a Duncan Phyfe dining table that was designed for our online store. This table is very popular and the design was intended to deliver everything clients ask for in formal dining tables. 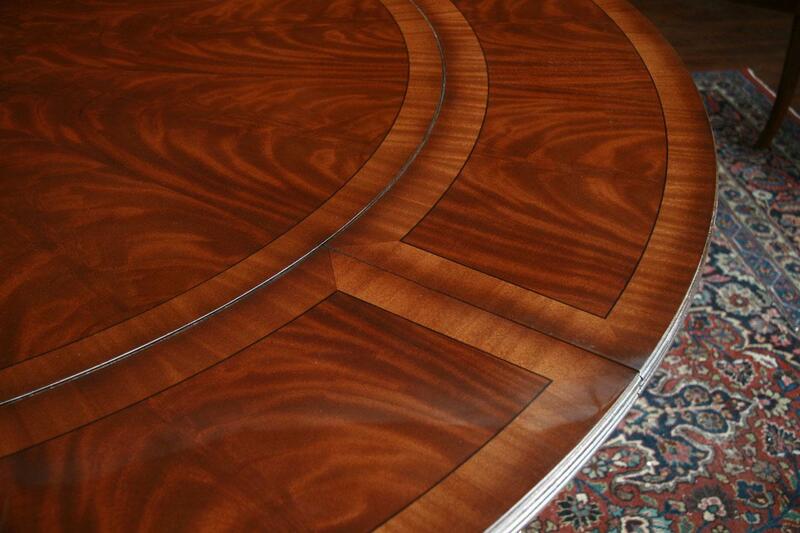 This mahogany dining table with leaves features a "D" shaped end, brown on brown banding, plus three leaves. This mahogany dining table also has an apron. 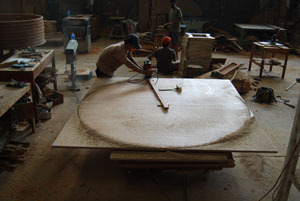 This 60" round dining table is cut with a router attached to an arm that helps the artisan cut a perfectly round shape. 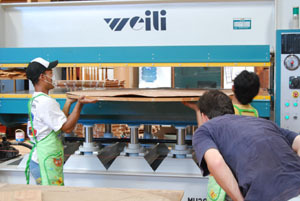 We do not use C&C routers or lasers to cut material. 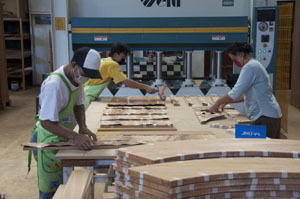 Everything in this factory is done by hand relying on the skills of our master craftsmen. 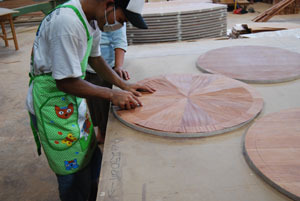 After initial cutting and shaping, flame mahogany veneer is placed onto the table's components. 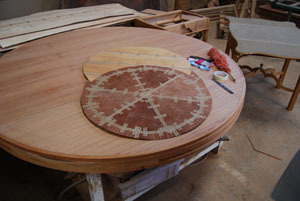 These oddly shaped components, shown below, are a part of a 60 round dining table with perimeter leaves. These leaves are shaped like bananas because they go around the outside of a round table to make it an extra large round dining table. 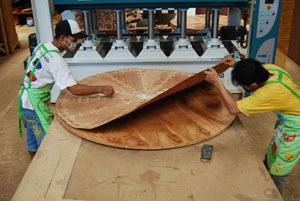 Once the flame mahogany veneers are positioned correctly, they are marked down with special masking table. 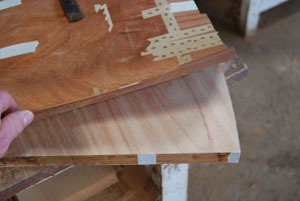 This tape has many pierced holes to allow the veneer glues to pass through easily. Look carefully along the outside edge of this table leaf and you'll notice numerous smaller pieces of this special masking tape positioned every few inches. This line of tape is holding the mahogany banding in place. 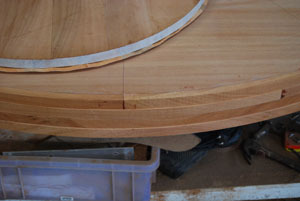 Even though the banding looks continuous around the table, it actually consists of many small sections. 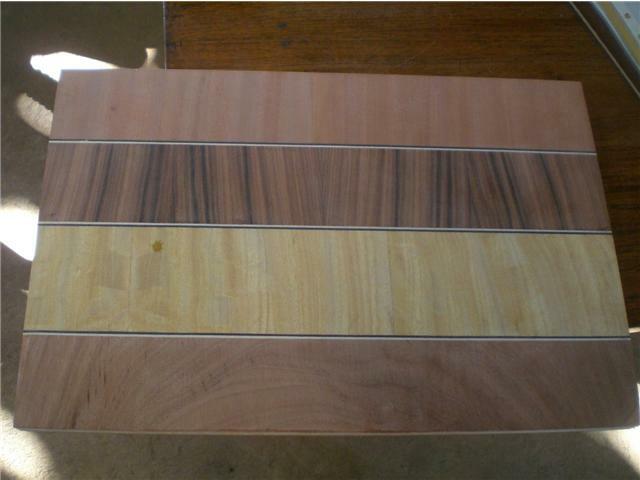 Banding looks seamless on a finished table. 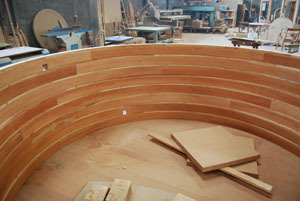 Round mahogany dining room table components stacked in our warehouse are shown below. The photos show perimeter skirt aprons on the left and table faces on the right. 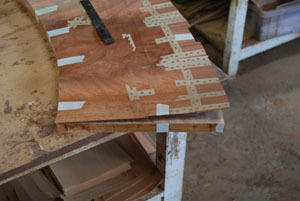 Mahogany dining table components are lined up on a work bench as they get ready for pressing. 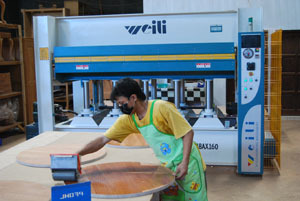 Here, veneers are laid down with a heat sensitive glue and pressed under heat and extreme pressure. Glue is applied to faces with a roller. 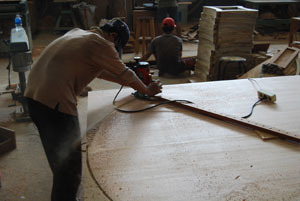 Mahogany accent tables, smaller tables, drawers faces and other components are done the same way. Here is another custom mahogany dining table built just for our online store. 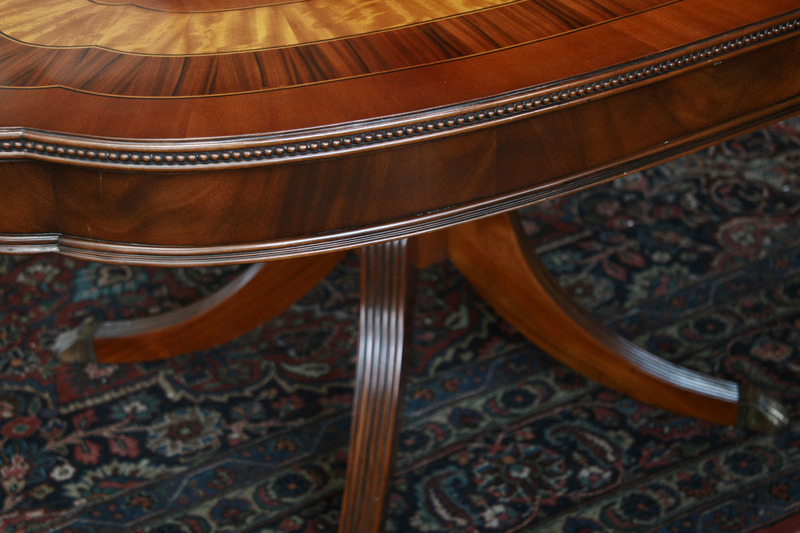 It features a true satinwood banding and mahogany field. This edge is hand carved and goes around the entire table and leaves. 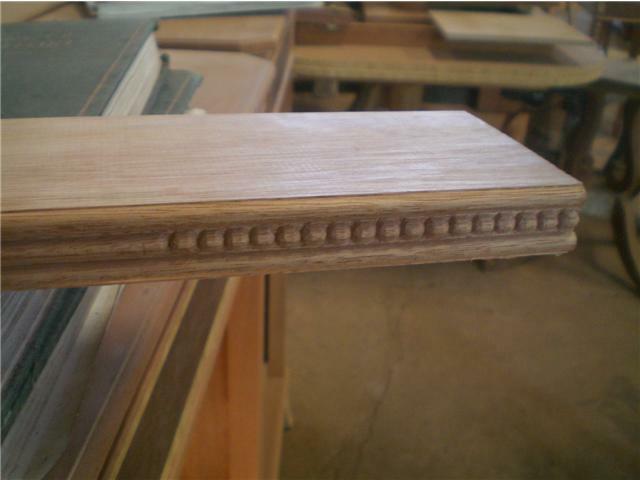 Also, this edge works nicely with our reeded pedestals. This is a 12 foot long dining table with three leaves. The following two pictures are from the design phase of our King Demure collection, which is a high end transitional design. These pictures are 3D renderings which lead to the final stage of factory drawings.